This reversible quilted 14K white gold cross pendant from Apples of Gold Jewelry is a truly unique pendant - the pendant is reversible, with a different design on each side. Made in 14K yellow gold, one side features a shiny cross, while the other side features a quilt design on a cross. Perfect for those who enjoy having different options to choose from, this pendant measures a 10mm in width and 26mm in length, making it a perfect size pendant for any occasion. 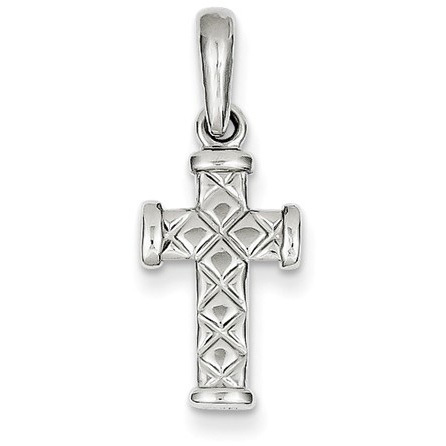 We guarantee our Reversible Quilted 14K White Gold Cross Pendant to be high quality, authentic jewelry, as described above.